We have worked with the Springfield Public Library for 8 years. 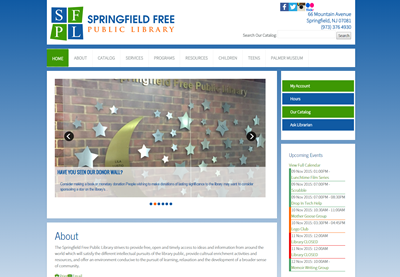 We started Springfield Public Library's first joomla site in 2007 with Joomla 1.0. Over the years we have upgraded it to each new Joomla version in order to take advantage of the new features available. Now in 2015, we have changed the look of the site completely. The library had a logo designed, and we built the site design around the clean look and colors of their logo. On their site they use: - event management - clean and easy to edit slide show - image galleries - web links to display database resources and links to other sources.